Bay windows can be built in different styles depending on how they will lend themselves to the interior decor or exterior design. Additionally, there is something called a bow window which, though it differs slightly from a bay window, operates on basically the same principle. Both bay windows and bow windows can be strictly decorative in nature, or they can also be functional as well as offering the desired touch in a decorative perspective. Before adding bay windows to a new home construction project, however, one may want to discuss with their builder and/or architect whether or not they are appropriate to the design of the home and the best window considering the local environment (from an energy efficiency aspect). Window treatments that cover, shade, and/or decorate bay windows, or bow windows, are called bay window treatments. 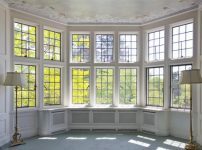 Bay windows, for those not familiar, are windows that project outwardly from the outside (exterior) wall of a building. Indoors, they frequently can serve as a display shelf or sitting area with or without cushioning. If you’re going to use your bay window for either of these, that could have an impact on which window treatment you choose. Bay windows are most commonly seen in living rooms but may appear in family rooms, studies, etc. As long as the architect, builder, and owner agree, a bay window could feasibly appear in any room desired – even on upper floors. There are several types of bay windows and, as previously mentioned, there is also a bow window. All differ slightly but can present their own challenges when it comes to window treatments. 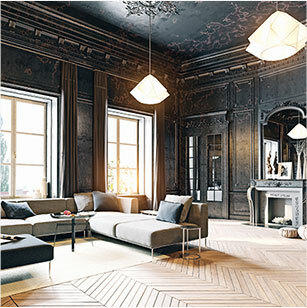 As always, things to consider when picking a window treatment are as follows: decor, how much lighting you want to block out or let him, what type of material will best suit your needs, whether or not there will be pets or children present, will these window treatments assist in energy efficiency, etc. 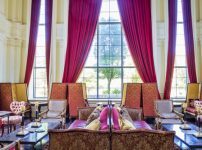 By working with a professional who knows the ins and outs of bay windows and the benefit of the proper window treatments, you will stand a better chance of picking the appropriate shades, blinds, draperies, etc. For example, a professional can explain that if you are going with draperies, basically two options are available: you can put a curtain on each window involved, which make up the entire, larger bay window… Or, you can mount 2 draperies on the interior wall – each will begin to either side of the larger window itself and draw shut in the middle. And, if you choose, you can still put something like a roman shade on each of the smaller windows. Want to Dress Up Your Bay Windows in Style? Bay windows can add a beautiful, elegant touch to any room and add just the right finishing touch to the exterior of some homes. They do, however, require the appropriate window treatments in order for the homeowner to get the most out of them. Talk to us if you want to find out more information on how to doll up your bay windows with exceptional window treatments.